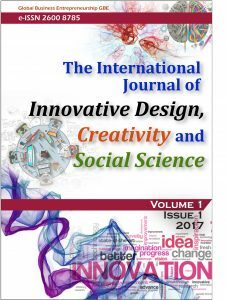 The International Journal of Innovative Design, Creativity and Social Sciences (IJIDeCS) is an academic publication, refereed journal that provides a forum for discussing the nature and potential of innovative design, creativity and social sciences from both theoretical and practical perspectives. The journal aims to not only promote existing research but pioneering in new innovative research in the existing field and disciplines of art and philosophy, industrial design, ergonomics, graphic and digital media, animation and illustration, human computer interaction, artificial intelligence, social sciences, information technology, industrial technology and similar areas. The submitted papers (analytical studies, constructive studies, case studies, field studies, literature surveys, book reviews, etc.) will be reviewed by potential experts discussing from their point of views and by the editors who will evaluate whether the papers can be accumulated to establish for an interdisciplinary academic research discipline.